Rembrandt Harmenszoon van Rijn (1606 – 1669) – A Dutch Master and one of the great artists of all time. Rembrandt was born in Leiden in the Netherlands in 1606. It was during a period known as the ‘Dutch Golden Age’. He came from a reasonably wealthy family. His father was a miller and somehow managed to send his son to a Latin school and later the University of Leiden. His education and knowledge of scriptures later proved important when he sought to capture the essence of biblical scenes in his art. 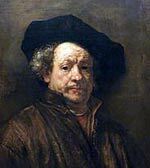 However, Rembrandt wasn’t inspired by studying and he left university to begin an apprenticeship as a painter in Leiden. In 1624, he spent his first period of time in Amsterdam where he was able to study under a famous painter called Pieter Lastman. With this period of apprenticeship under his belt, he returned to his hometown in Leiden and set up his own independent workshop. In 1629, Rembrandt was discovered by the statesman Constantijn Huygens, who secured for Rembrandt important commissions from the Court of the Hague. This source of commissions was important because, in Holland, the Protestant Reformed Church did not support artists like the old Catholic church. 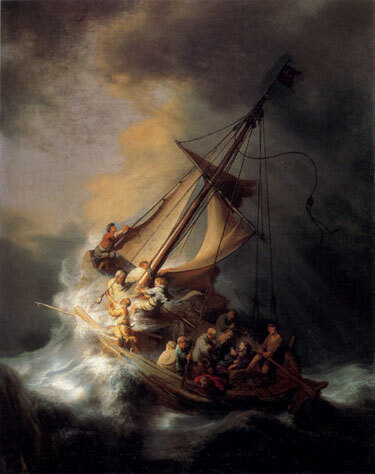 This was the start of Rembrandt’s successful professional career as an artist and, in 1831, he moved the expanding business to the capital Amsterdam. It was here that he met and married his future wife, Saskia Van Uylenburg – who came from a wealthy family and this added to Rembrandt’s income. Around this time, Rembrandt began to take on students, and he became admitted to the Guild of Painters. Unfortunately, Rembrandt’s family life was subject to many misfortunes. Three of their four children died in early infancy, and Saskia died after only ten years of marriage in 1641, aged just 30. This personal tragedy seemed to bring forth an added emotion and intensity in the paintings and art of Rembrandt as a painter. His bedside paintings of his dying wife are indicative of his ability to encapsulate human emotion and display Rembrandt’s profound ability to empathise with aspects of the human condition. ca. 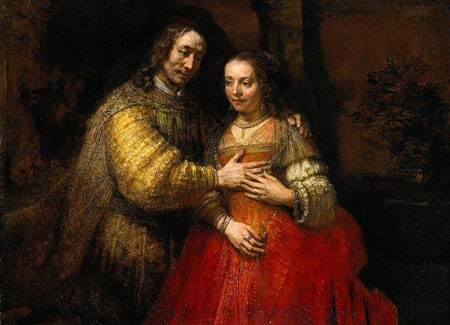 1667 Portrait of a couple as figures from the Old Testament, known as The Jewish bride. At the height of his fame and wealth, Rembrandt bought an impressively large and expensive house in the Jewish quarter. He bought this on a mortgage of 13,000 Guilders. Unfortunately, Rembrandt was not good with money. He would spend his income very freely; often on other works of art and props for his paintings. 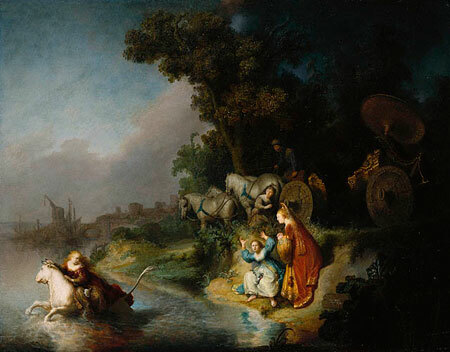 Then in the 1650s, Holland suffered a severe economic depression and many lucrative commissions dried up, leaving Rembrandt unable to meet his mortgage payments. This caused him to effectively declare bankruptcy (though he did it in a way to avoid jail). Though Rembrandt’s paintings have often sold for millions of dollars, he died penniless, and the cost of his burial had to be met by his friends. Rembrandt loved to paint alone. In fact, he could not bear to be disturbed while painting and often would take an oath to work in pin drop silence. He said that when painting, he would not even give an audience to the first monarch of the world. Unlike many artists of his day, Rembrandt, never visited Italy to see the work of the great Masters. He felt that everything he needed to learn from painting he could do in his own country. Nevertheless, he was influenced by some of the trends of the day. Following the innovation of Caravaggio, Rembrandt incorporated the art of chiaroscuro – a dramatic use of lighting. 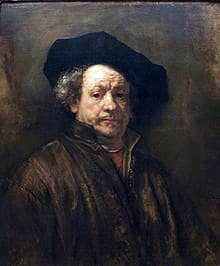 In particular, Rembrandt used this technique to give great depth and emotion to the faces he painted. Rembrandt had the ability to give an impression of a thinking mind behind the face. In a letter to Huyghens, Rembrandt explained in his art he sought to give ‘the greatest and most natural movement,’ movement can also mean ’emotion and motive. As well as producing many paintings and portraits, Rembrandt produced many etchings. Citation: Pettinger, Tejvan. 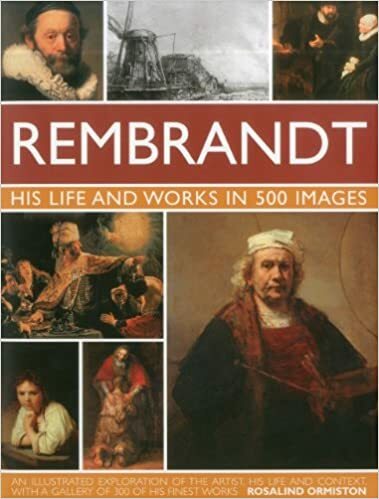 “Biography of Rembrandt”, Oxford, www.biographyonline.net, 26th Dec. 2009. Updated 26 January 2018.